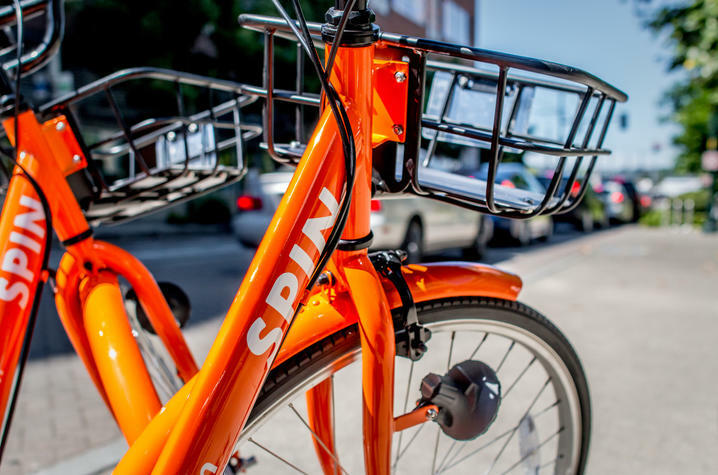 LEXINGTON, Ky. (June 26, 2018) — The University of Kentucky last month announced a partnership with Spin, a personal mobility company that will be providing a new bike share program both on campus and throughout the city of Lexington. Yesterday, the first batch of these bikes started hitting the streets and are now available to ride. As part of the staggered launch happening throughout the week, the bikes will start popping up at designated parking areas on campus over the next few days. Using this new service is easy and affordable. Download the Spin app, create a membership with your uky.edu email address, and then find the bike nearest you using the app. UK Students and employees can ride for $0.50 per half hour, $14 for unlimited monthly rides, or $49 for unlimited annual rides; a 50% discount on standard fares. Unlimited annual rides is one of the optional benefits available to many members of the UK Commute Club, a new transportation incentive program for any member of the campus community who does not have a parking permit. The program is dockless - meaning the bicycles have a self-locking mechanism and don’t always need a bike rack in order to park. However, parking on campus is limited to 30 designated zones. These zones are clearly identified in the Spin app and will soon be featured on the UK Interactive Bicycle Map. Monday through Friday, 140 of these bikes will be relocated to seven rebalance points on campus by the Spin team. Off campus, the bicycles can park anywhere within the public right of way, so long as they’re not blocking sidewalks or building entrances. For interested users without a smartphone or bank account, pre-loaded cards will soon be available for purchase at several locations around the city, as well as at the UK Transportation Services office in the Press Avenue Garage. UK’s partnership with Spin is one of the many ways UK is working to increase mobility options to, from and around campus. These options already include BluPass, the Bike Voucher and Cash Out programs, Car Sharing, and the Wildcat Wheels Bicycle Library.